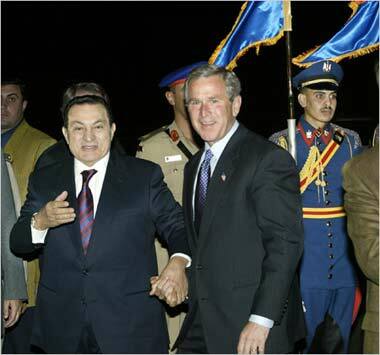 Holding hands: Egyptian President Hosni Mubarak welcomes U.S. President George W. Bush to Sharm el-Sheikh, Egypt on June 2, 2003. Photo from AP. History is rife with examples of U.S. foreign policy being directed at overthrowing left-wing regimes and favoring military or right-wing dictators. The two-week citizen uprising in Egypt has placed the U.S. government in a difficult position. Its support of dictators who will do our bidding always leads to foreign relations problems when those dictators are overthrown. Recent American and world history is rife with examples of U.S. foreign policy being directed at overthrowing left-wing regimes and favoring military or right-wing dictators. In almost all such cases we are left with the enmity of the people in those countries. If we go back just 60 years or so, we find our relations in Cuba were endangered by our embrace of Batista. When the revolution in Cuba led by Fidel Castro drove Batista from power, the government that followed was not to our liking, so we have had 60-plus years of embargoes, assassination attempts, and animosity toward Cuba by a succession of U.S. presidents from Eisenhower through Obama. Our disdain for Cuba’s form of government, which is dominated by the Cuban Communist Party, and the influence of Cuban emigres in the U.S. have prevented normal relations with the country. This impasse has not worked well for either Cuba or the U.S. While Castro has always been a Communist dictator, the kind we never support, throughout Central America and South America, the U.S. has embraced many right-wing dictators. But perhaps the worst blunder we have committed is to train and fund vicious militaries in El Salvador, Guatemala, Panama, Honduras, and elsewhere in the Americas. And at least seven times in the last century we sent American troops to Honduras to protect the banana plantations of American-owned companies. And we have intervened militarily and covertly in Haiti, the Dominican Republic, Panama, and elsewhere. During Ronald Reagan’s administration, the overt attempt to overthrow the Nicaraguan government by training and arming Contra (anti-Communist) guerrillas located in Honduras was a sorry spectacle. It began as an effort to improve U.S.-Iranian relations by having Israel sell weapons to a select group of Iranians. The U.S. would resupply the weapons to Israel and receive the Israeli payment. The Iranians promised to try to get the release of six U.S. hostages, who were being held by the Lebanese group Hezbollah, who were protected by a military group in Iran. Some of the proceeds from the weapon sales were diverted illegally to fund the Contras. It was never proved that President Reagan understood the details of the arms-for-hostages deal, especially the diversion of funds to support the Contras, an act prohibited by the U.S. Congress. Our history in South America during roughly the last 60 years reveals more of the same kinds of practices that were carried out in Central America. We backed the ouster of Allende in Chile in 1973, and more recently the ouster or assassination of Hugo Chavez in Venezuela. And we supported mostly military dictatorships in Paraguay, Bolivia, Brazil, Uruguay, Peru, Argentina, and Colombia, where U.S. policy has focused on stamping out the drug trade. Many of those countries have now elected democratic socialist governments that we are trying to destabilize. Recent U.S. foreign policy in Asia and the Pacific Rim has seen U.S. military and CIA support for dictators in Indonesia, South Viet Nam, Myanmar/Burma, the Philippines, and elsewhere. In Africa, military and CIA activities to undermine regimes have followed patterns similar to those in the rest of the world. The countries of Angola, Libya, Sudan, Somalia, Nigeria, and others (none more so than the Congo -- now Zaire -- where its prime minister, Patrice Lumumba, was assassinated by order of the Belgian government with U.S. involvement in 1961), have all suffered from the U.S. pursuit of its economic and geopolitical goals. The Middle East in recent history has fared no better than the rest of the world, perhaps worse, with overt and covert U.S. activity in Iran, Turkey, Iraq, Yemen, Jordan, Syria, Lebanon, Afghanistan, Pakistan, and other countries. In almost all of these cases, the United States was interfering in the internal affairs of a foreign country to overthrow left-wing regimes or help right-wing regimes rise to power or maintain power. And it hasn’t mattered whether a Democrat or a Republican was president. With Egypt, we have supported for 30 years the vicious dictatorship of Hosni Mubarak, to whom we have given over a billion dollars a year to sustain his regime, largely because he has been willing to cooperate with U.S. policy in the region, especially policy regarding Israel. Now he may be deposed by his own people, who have risen up to demand his ouster after decades of political corruption, interference with and killing of journalists, torture of prisoners, and the practice of extralegal arrests and disappearances of dissidents. To protect its perceived interests, the U.S. is swinging its support to the architect of many of those atrocities -- Omar Suleiman. Suleiman, Mubarak’s long-time intelligence chief, was named by Mubarak as his vice-president, and the U.S. is pushing to have Suleiman organize a new process for continuing the government after Mubarak’s term ends this coming September. But the demonstrators calling for Mubarak’s ouster, who have been occupying Tahrir Square for two weeks, rightly suspect a plan backed by the United States and directed by Suleiman. A plan far better than back-room deals regarding the fate of Egypt’s political future was proposed recently by Tarek Masoud, a political scientist and Middle East specialist and an assistant professor of public policy at the Kennedy School of Government at Harvard. It follows Egypt’s Constitution and provides a way for the Egyptian people to have free and fair elections. Masoud’s plan is for Mubarak to dissolve parliament, a power only an elected president possesses under the Egyptian Constitution, and call for new parliamentary elections (which presumably could be directed by an independent tribunal to assure that they are fair and honestly reflect the will of the Egyptian people). Masoud’s proposal calls also for a new parliament to enact changes in Egypt’s Constitution that makes the selection this fall of a new president more open and assures that another dictator could not come to power and thwart the will of the people. Of course, the U.S. does not support the will of the Egyptian people any more than it supported the will of the Iranian people, or the Nicaraguan people, or the Chilean people, or the Venezuelan people in times past. The people’s will may not favor U.S. interests, so the U.S. will take action to make sure that we have our way. When the world does not bend to our will, we do everything we can to get our way, including resorting to violence, either through our military might or through covert means. And our military might is spread around on over 1,000 installations in 177 countries, along with numerous submarines and battleships at the ready throughout the world.